The Children’s Center Rehabilitation Hospital is raising funds for a HydroWorx aquatic therapy pool. The Hospital’s current therapy pool is more than thirty-years-old and has been non-operational for over one year. Aquatic therapy is a vital piece of the rehabilitation process. It provides increased joint flexibility and muscle strength. It decreases pain and abnormal muscle tone, and improves balance. The current pool, when operational, accommodated an estimated 25 percent of the patient population due to its design. Talisa and Anna enjoy their pool time. The new pool’s design will allow 75 percent of the Hospital’s inpatients and 25 percent of their outpatients to receive aquatic therapy. The pool features an adjustable floor and water depth, variable-speed underwater treadmill, and resistance therapy jets. Aside from the many therapy benefits, patients also have the chance for water play. Chantelle loves to be in the water. Every year, four days are set aside to celebrate summer fun days. During this short period of time the Hospital staff creatively transforms a courtyard into an outdoor oasis. There are inflatable pools, bubbles, and sandboxes making the outside space come alive with summer fun. There is no shortage of smiles as the patients splash and play in the cool water. 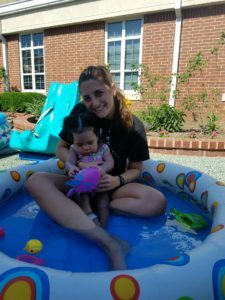 “It amazes me how our patients respond to the small pools. Some get excited and love to splash their families and staff. Other patients get in the pool and relax, enjoying the feeling of their body being weightless. 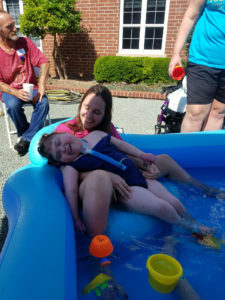 Summer is always a fun time for children and we provide that experience during summer fun days,” said Camilla Dadulo, special education teacher, The Children’s Center Rehabilitation Hospital. The majority of patients at the Hospital aren’t able to go to public pools and lakes or visit the ocean. Bringing families together to enjoy the water is a wonderful way for them to connect. “This is an exciting time for our patients to enjoy playing in the water. Families say this is one of their favorite activities we do at the Hospital,” said Dadulo. If you would like to donate to funding the pool and help our patients enjoy the water all year-round, please click here.